You can buy the whole package with the easel, tripod, palette shelf, and carrying bag, or pick and choose among any of these. Since I already had a decent tripod (Slik Heavy-Duty Tripod with 3-Way Fluid-Effect Head and Built-In Bubble Level), I bought the easel attachment and the shelf. Fits into most backpacks, which means that your entire plein air setup can be carried in one backpack (the tripod can either go inside the backpack or be attached with straps outside). Despite being so thin and lightweight, the easel is actually relatively sturdy. It is made out of ABS plastic, which you can bend a little - but so far, it has stayed flat and straight. Compared to the heavy french easels with all of their paraphernalia, En Plein Air Pro just looks cool. Anytime I paint outside with some new people, somebody asks me about the easel. The above mentioned hook for the water container is on the bottom right, which makes the easel board bend and lean that way whenever a normal size water bucket (like the popular collapsible water jar) is hanging from it. I usually just put the water container in the middle of my John Pike Watercolor Palette - 15 x 10.5 which sits on the shelf. It looks like the Original Series easel has the hook in the middle. I'm guessing, the hanging water container was interfering with the user's ability to reach into the back of the shelf/palette, so they moved the hook to the side. 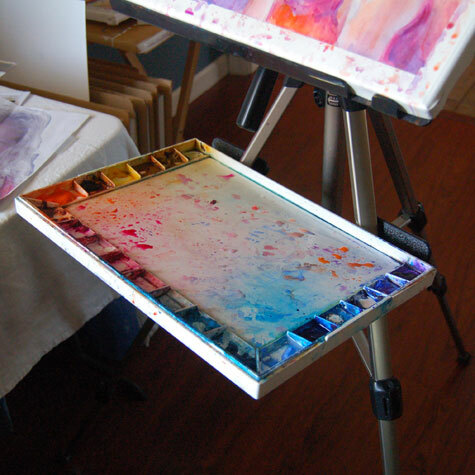 The new Advanced Series Plein Air Pro palette shelf lets you put the water under the shelf, so you don't have to worry about those hooks at all. 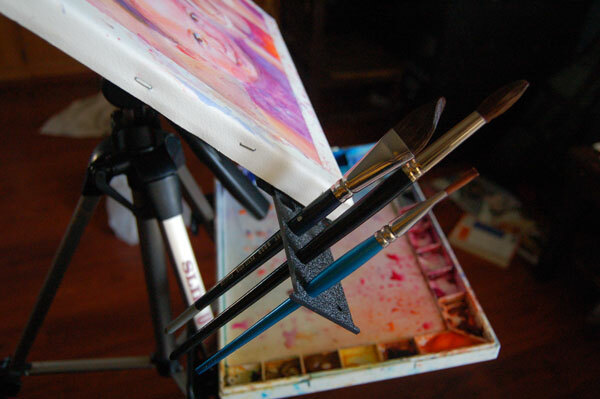 Since this is a portable easel, you should probably expect to be limited in your choice of painting surface sizes. In the case of this easel, anything taller than 16-17 inches feels too big. It is definitely awkward to work on something like a vertical 16x20 piece. Because of the angle of the tripod legs, the shelf is tilted back, towards the center of the tripod, when all three legs are extended the same amount. To correct that, I make the rear leg longer, so that the whole tripod is leaning forward. This makes the shelf level but at the expense of shifting the tripod balance. I have had it topple over at the slightest touch of my 2-year-old. (Tip. Keep those toddlers away from your easels...especially if there is something on the easels that you care about). It looks like the Advanced Series palette shelf also fixes the tilting issue by introducing adjustable tabs. Umbrellas for plein air are not likely to work with this kind of setup. It would just be too heavy and throw the balance to the wind. But then, I don't even own an umbrella. As with most portable setups, you have to watch out for that wind I just mentioned and weigh the tripod down. You also need to tighten the tripod mount screw quite well before attaching the easel to the tripod - otherwise, the board develops the tendency to slowly but surely rotate counterclockwise. 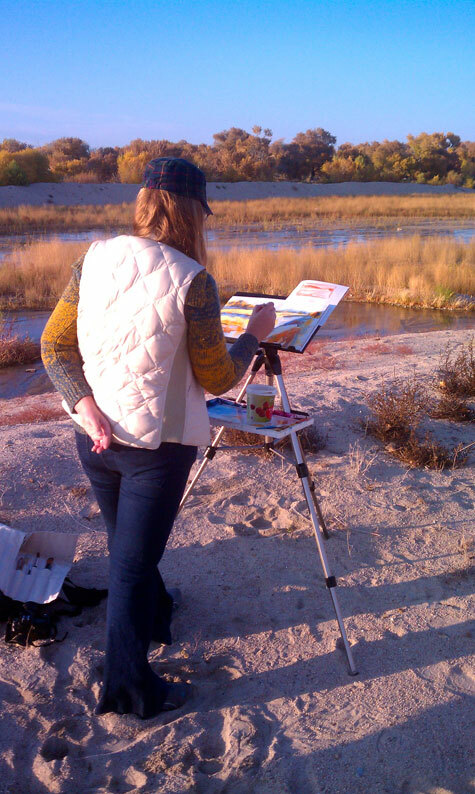 Because of the portability and flexibility, I use En Plein Air Pro more than my studio easel. I take it outside, I bring it to my classes, and I paint on it at home. If I didn't already have a large palette, I would likely get the Advanced palette shelf. Nice soundtrack, too. Some Norwegian Radiohead :) Correction: Icelandic Radiohead (Wikipedia told me so). Sigur Ros. Oh, and the other video on his website "is not available in my country." Thanks so much, Sony. Ewa Karpinska takes the mystery out of the "difficult" medium and explains how to achieve the effects you want to see in your watercolor painting. 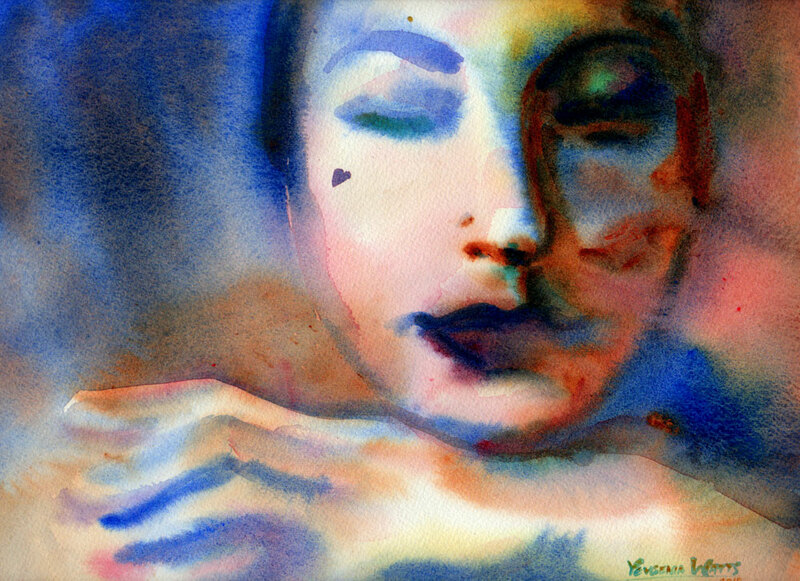 She offers a systematic approach to wet-into-wet watercolor painting that makes sense. She breaks the "water cycle" (when water is applied to paper) down into seven stages: lens, mirror, shiny, semi-matt, cool matt, dry matt, and dry (only the five stages in between "lens" and "dry" are relevant to wet-into-wet painting). Using three different consistencies of paint (dilute, creamy, and pasty) and five color application methods (dropping in, tilting support, "skating", drawing, and "keeping a drop on a leash") she gives the reader 5 x 3 x 5 minus the incompatible combinations (like dry matt and tilting) = around 45 recipes for wet-into-wet effects. Of course, the success of these recipes depend on variables like timing, amount of water, amount of pigment, and humidity. You still have to figure out the right moments for the right actions, and master the elusive medium by practice - but if you need to understand how it all works first, this book is great. 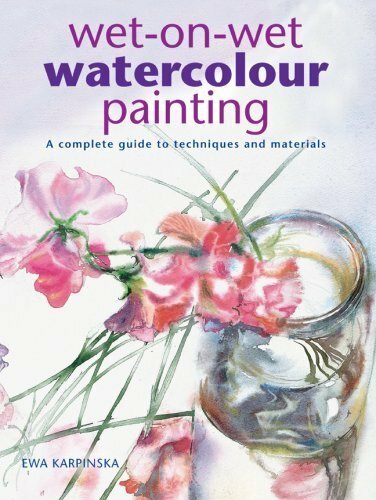 I was actually a little turned off by the cover when I was buying the book online, but as it was recommended to me by an artist I admire (Jean Haines), I went ahead and got it. And I am so glad I did! There are wonderful, dreamy paintings by Karpinska inside and several step-by-step tutorials as well. Here is a brief demystification of wet-into-wet watercolor techniques at Handprint.com. Can you use makeup brushes for painting? Before writing this post, I did a google search about using makeup brushes for painting and almost all the results were actually about using painting brushes for makeup (some even claim it is cheaper). So let me tell you my story. After attempting a couple of half and full sheet paintings recently, I discovered that my 1 1/2 inch taklon (good-ish synthetic) brush was no longer coping when I wanted to cover a large area in paint and achieve a smooth wash. Nor was my #36 round brush (also synthetic). It logically followed that I need a big brush with good paint-holding capacity (i.e. natural hair). If you ever looked for one, you know that even squirrel brushes start somewhere at $40 for 1" flat. And a very quick wash on a half sheet (22x15"). I haven't even tried to make it smooth, hence some streaks. It is still a hundred times better than something I would get with my synthetic flat. ...who is another architect addicted to watercolor and whose influence I can now clearly see in Rebecca Elfast's work (Rebecca is an architect, too. I feel like I'm not that unique in having an architectural background and a burning passion for watercolor. I only hope they aren't doomed to sitting in front of a computer screen wishing they'd rather be painting). Amstrand's paintings make me think of the so-called Scandinavian design and of quiet places that are great for things like pondering and reminiscing. I am probably hopelessly behind everybody who knows something about the contemporary watercolor "scene", but I just had to share my recent discovery: Alvaro Castagnet. I looove the foggy areas in his paintings...And the touches of drybrush here and there. Fantastic. Unlike with our local markets and swaps, we actually had expectations for this one. It was supposed to show whether or not we are ready for large regional events and whether it is worth paying $200+ to participate. Well, when it comes to generating interest and attracting visitors, I think we are ready. A lot of people stopped by. It is the beauty of an art-dedicated event: all who come there come for the art. It was great to have an "audience" with a genuine interest in and appreciation of my work and art in general. When it comes to sales...er...it wasn't that good. 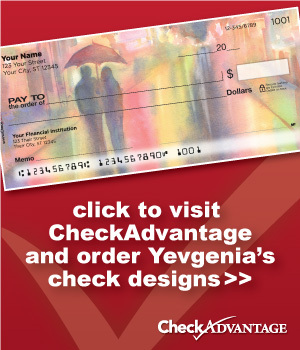 We did make our money back with a very small profit on top which disappears when you count things like gas and food. We didn't have to pay for a night's sleep (our friends at Camp Pendleton were kind enough to let us stay with them AND they came to the show AND they bought an original painting and a print) or for childcare (my family was visiting and they were more than glad to watch the kid while chilling at the nearby beach). Still, we didn't lose money, and that's something, right? some comments people made...Like, coming from a dark-long-haired young man with a guitar, "All these colors...This is just too happy for me. I like Gothic...And why so many babies?" - the babies (five of them) are on the wall with examples of my portraits. being a Yupo-evangelist. I even gave a little piece of Yupo to one lady. A few days before the fair, I was email-interviewed by Jennifer The Milk Mixer. Jennifer is an artist herself, and maintains a blog where she writes about creative people she meets. She found me through Twitter (@YevgeniaWatts) and liked my paintings. She asked me if she could feature me on her blog - and of course, I was all for it! You can read the mini-interview here. So, did you do the Artist Network TV free 4-day weekend? I did. And even though I felt that there was too much basic stuff and not enough good watercolor videos, it was nice. I "discovered" Stephen Quiller. That is, I've definitely heard the name before and saw some works, but last weekend, I discovered the way he paints. Fantastic. If I ever have a chance to take his workshop, I will. I enjoyed Mark Mehaffey's watercolor on Yupo workshop, even though most of the techniques and tricks he showed I already learned by myself and with the help of my online artist buddies. It was still fun. When working from a photo, put it away as soon as you can. Copy machines do the copying, you do art. When you don't have the photo to imitate, you have to refer to your own mind which is a good way to bring a bit of you into the painting. When doing portraits, of course, I tend to hold on to the photos longer, but I still like to finish the painting without looking at the photo. It's not a "find 20 differences" game, it's a work of art. I knew that most American watercolorists prefer flat brushes to round ones, but now I saw the flat brushes in action. I still like the round-ness of the round brush, and its ability to pick up the paint from my St Petersburg 24 pan set (a good size flat brush is too big for it). I still think that a round is better for some things - but I will be experimenting with flats, too. A masking liquid tip that I already tested and determined that it's great: When masking, dip your brush (that you dedicated to masking for life) into water, then watered-down dish soap, then water. Repeat as needed. This keeps your brush clean! It's better to under-do a painting than to over-do. Everybody knows it but we still need to be reminded now and then. Quiller actually said something along the lines of "When you're beginning to have a really great time doing something (like splashing paint or placing your trees in a landscape) - STOP!" paint stays wet for much longer than on cotton cold press (or hot press). I guess this could be a disadvantage, too, but it does give you more time to play. Yupo is extremely sensitive to any at all grease. While this can be used to create nice effects in the painting, I was a little disappointed to see my own fingerprints all over the paintings. You do need to be tidy when working on Yupo. layering of paint, while still an option, doesn't work quite like it would on cotton paper. The underlying layer tends to smudge and mix with the new one. In the painting of poppies, I wish I didn't do the second layer. It is relatively easy to scratch the paint away from the surface of the paper. I used this effect in the painting, but I also found myself a little worried later that the painting would get scratched just from handling. 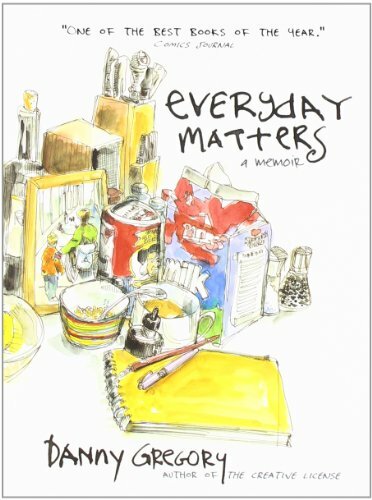 One of the books I'm reading now is Danny Gregory's "Everyday Matters." I've always liked books where pictures take up more space than words. It is great, and my only regret is that it is so short. One quote that I wanted to share is about the process of drawing: The reason why most people draw badly is because they draw symbols instead of what they see. A nose is a sort of triangle. An eye is a circle with another one inside. An ear is a circle with a squiggle. The brain has an inventory of shorthand symbols for stuff and that's what we draw. It's very human. Assigning things to categories, using symbols and signs; these skills separate us from the beasts. Unfortunately, these symbols are a screen through which we come to see the world. We say, "That person is rich, that one's crass. He's a criminal type, she's a blonde, they're famous, she's in a wheelchair..." We lump people and things and experiences into categories and deal with them accordingly. It's efficient but it strips the world of texture and chance, like eating every meal at McDonald's or wearing the same uniform every day. This kind of thinking shows itself when we try to draw. In fact, that's the reason most people will say, "Oh, I can't draw." Kids never say that, until they reach the age of twelve or so, and their symbols are hard-baked. On a different note, another book I'm reading is "The 12 Secrets of Highly Creative Women" by Gail McMeekin." It has glowing reviews on Amazon but so far, I'm finding it quite disappointing. The best thing about it is the quotes on the margins. It could be useful to somebody who is stressed, depressed and lost in their life and has no creative outlet. I was looking for practical advice and this book is more like a counselor. Get in touch with your intuition, spend time with yourself, and fuel your creative energy. All good stuff but nothing new.